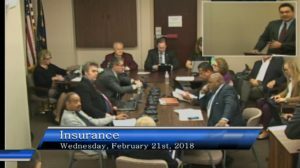 “That largely explains it,” Insurance Institute of Indiana and State Farm lobbyist Jon Zarich told a state House committee Feb. 21 in presenting an amendment at least one of them hadn’t seen. But his summary of the amended Senate Bill 164 omitted any mention that the proposed language would effectively strip away auto insurance policyholders’ right to assign insurance benefits to body shops. (4) Include in a contract with an insured or a claimant a provision assigning any rights of the insured or claimant to the repair shop or a third party. (5) Accept the assignment of any rights of an insured or a claimant related to the repair of the motor vehicle. The consumer wants their car fixed correctly and without having to pay more than the deductible — that’s why they’ve been paying premiums all those years. Insurers often don’t want to pay what a quality shop is worth. A shop who doesn’t want to eat those costs therefore can either bill the consumer for the difference and let the customer try to collect from the stingy carrier (similar to the health insurance model) in court or other channels. Or, in a third-party claim, the shop can bill the consumer, who would then need to sue the at-fault third-party insured to collect the difference. As the carrier is obligated by the policy to make the victim whole and defend the insured, the litigation (if successful) leads to the consumer collecting from the carrier. Assignment of benefits can let the shop behave as the customer in both scenarios, pursuing the money through litigation or other means. As a shop is likely more versed than the customer in insurance law and what a proper repair and refinish entails and costs — not to mention that the poor customer just wants their car back and to get on with their lives — an assignment of proceeds can simplify things for both the repairer and consumer. An AOB or AOP also means insurers might have a harder time ducking their obligations to pay out the costs for which they’ve already been collecting premiums in anticipation. To adapt an analogy from P&L Consultants’ Larry Montanez, using claims as a profit center is effectively reneging a little on a bet. It’s like putting down $5 on red at roulette and keeping all $5 in profit if you win but attempting to pay the house just $4.50 if you lose. Zarich also didn’t mention the deletion of language requiring insurers to investigate claims quickly, regardless of which body shop the consumer preferred, until asked about the previous language by Rep. Vernon Smith, D-Gary. (2) Failing to acknowledge and act reasonably promptly upon communications with respect to claims arising under insurance policies. (5) Failing to affirm or deny coverage of claims within a reasonable time after proof of loss statements have been completed. (12) Delaying the investigation or payment of claims by requiring an insured, a claimant, or the physician of either to submit a preliminary claim report and then requiring the subsequent submission of formal proof of loss forms, both of which submissions contain substantially the same information. (13) Failing to promptly settle claims, where liability has become reasonably clear, under one (1) portion of the insurance policy coverage in order to influence settlements under other portions of the insurance policy coverage. (14) Failing to promptly provide a reasonable explanation of the basis in the insurance policy in relation to the facts or applicable law for denial of a claim or for the offer of a compromise settlement. Zarich said that in his opinion, if an insurer delayed a claim a week on a fact situation and didn’t contact the policyholder, “that would be a situation where there was a delay.” He said consumers could always file a complaint with the Department of Insurance if the insurer was taking too long. Rep. Gregory Porter, D-Indianapolis, asked how long it would take a claim to go through the DOI. Zarich said that in his experience, the DOI investigates complaints “in a timely manner,” to which Porter countered that words like “promptly” and “timely” are “out there for attorneys” and don’t help a policyholder without a second vehicle or struggling financially. None of the provisions in existing law seem to clearly forbid a carrier from being less “prompt” when a collision repairer outside their direct repair program network handles the claim. Technically, the Senate version of SB 164 doesn’t specify the times need to be identical for shops in and out of DRPs either, but it adds a layer of letter and spirit to the law suggesting that insurers shouldn’t be treating customers differently when they select an out-of-network shop. “Indiana really didn’t have anything on the books on steering,” Zarich said.